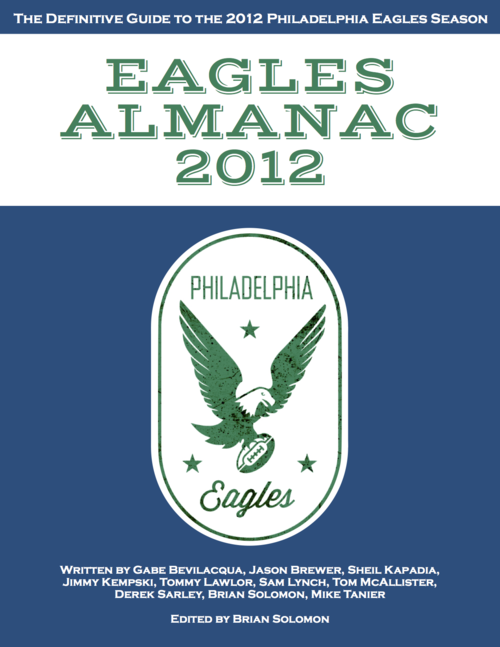 Today I’m proud to introduce Eagles Almanac 2012. This is a project that that has been in the works secretly for months, a collaboration between 10 of your favorite writers, bloggers, and reporters to create the single best, most comprehensive guide to the 2012 Philadelpha Eagles season. The book, which you can download now as a PDF, is more than 80 ad-free pages of absolutely wall-to-wall Eagles content. There’s statistics, analysis, opinion, predictions, and even a dash of personal reflection thrown in for good measure. Mike Tanier (Football Outsiders and The New York Times), broke down the failings of Juan Castillo’s defensive play calling. Tommy Lawlor (Iggles Blitz) penned a comprehensive draft review, as well as a personal recollection of the 1992 Eagles season. Sheil Kapadia (Moving the Chains) analyzed what exactly happened to Michael Vick last year. Jason Brewer (Bleeding Green Nation) looked at how 2012 is shaping up to be make-or-break season for Andy Reid, after 13 years on the job. Jimmy Kempski (Blogging the bEast) put together the only NFC East preview you will ever need to read. Tom McAllister (Bury Me In My Jersey) discussed the fragility of rabid Eagles fandom at age 30. Derek Sarley (IgglesBlog) asked if Nnamdi Asomugha is on his last legs, and wondered what’s going on with Evan Mathis. Sam Lynch (IgglesBlitz) looked ahead to the team’s problems and potential in 2013 and beyond. Gabe Bevilacqua (IgglesBlog) gives advice for living in a (cruel) world where the Giants have won two of the last five Super Bowls. And your truly examined LeSean McCoy’s breakout 2011 season and how he can actually improve from here. Plus so much more! Given the hard work that’s gone into this book from all of us, I think it’s a steal at our price of $4.99, and I hope you think so too. At the end of the day, it’s a chance to get more top-notch Eagles content and support your favorite writers at the same time. Buy the Eagles Almanac 2012 today! Tagged with Philadelphia Eagles, NFL, Eagles Almanac, 2012, Mike Tanier, Tommy Lawlor, Sheil Kapadia, Jason Brewer, Jimmy Kempski, Tom McAllister, Derek Sarley, Sam Lynch, Gabe Bevilacqua. June 25, 2012 by Brian Solomon.